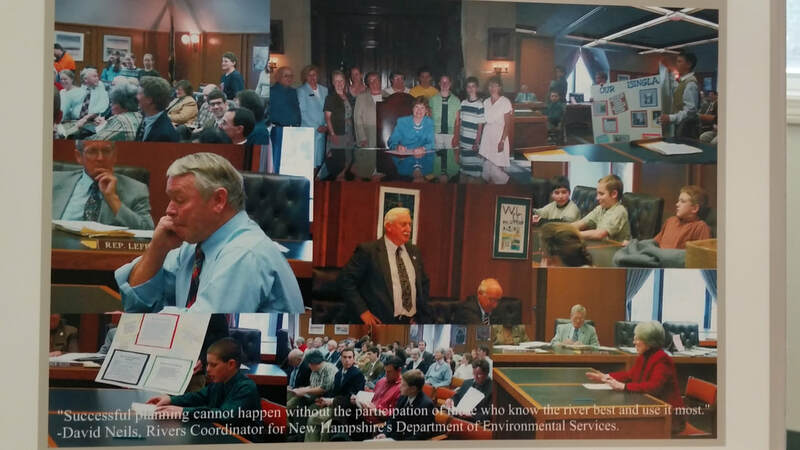 In 2000, Ann Schulz of Barrington, NH created the Isinglass River Protection Project (IRPP). Ann had already been active doing water monitoring on the Isinglass River with the Cocheco River Watershed Coalition (CRWC) for the NH Department of Environmental Services (DES) Volunteer River Assessment Program (VRAP) since 1998. Ann was impressed with the excellent water quality of the Isinglass River and wanted it to be maintained. After consultation with Lorie Chase, then Chair of CRWC, Ann contacted the Barrington, Strafford, and Rochester Conservation Commissions to request assistance in nominating the Isinglass River into the NH Rivers Management and Protection Program in order to gain more protection for the river. Ann and her husband Jim protected their own Isinglass riverfront land in Barrington with a conservation easement. Jim and Ann Shulz had created the Barrington Natural Heritage Committee in 1999 to develop an inventory of the town's special places and protect them. While Jim worked on protecting land, Ann worked on protecting the Isinglass River. IRLAC would not exist without Ann's efforts over the years and our work and this website are dedicated to her memory. Sadly, Ann passed away in 2017 but her legacy lives on in perpetuity with the protection of the Isinglass River. Once formed, The IRPP consisted of 13 member volunteers and 5 participating consultants. They worked diligently toward nomination of the Isinglass River, with a long term purpose of protecting the river from the pressures of development. The group organized a strong network of support through educational outreach programs, petitions and public meetings. Their members included the “Kids of the River”, a group of Barrington Middle School students guided by Pam Skeffington and John Pontius. The Kids of the River committed themselves to learning about the river and promoting its protection. The students were exceptionally well received during their testimony before the NH House of Representatives committee considering the Isinglass nomination for designation. Designation was received in 2002. The river's nomination showcased the river’s values and importance to the local communities as a valuable environmental, historical and recreational resource. Following designation of the river, several members of the IRPP were appointed as members of the Isinglass River Local Advisory Committee (IRLAC). IRLAC is made up of citizen and business representatives nominated by the municipal governments in Rochester, Barrington and Strafford, New Hampshire. Representatives are then appointed to the Committee by the Commissioner of the NH Department of Environmental Services (NHDES). Committee members represent a broad range of interests and backgrounds, and serve 3-year terms. The main responsibilities of the advisory committee are to develop and implement a local river corridor management plan and to advise local, state, and federal governing bodies and agencies on proposed development activities and land use changes which may affect the water quality or flow of the protected river or segment. The committee plays a vital role in protecting not only the river, but its shore lands as well. The Isinglass River Management Plan was first developed in 2008 to help ensure that the outstanding qualities of the river are protected for future generations. The plan was revised in 2018 and continues to focus on environmental and land use issues within the river corridor and the watershed including protecting and conserving the river's many resources, protecting riparian and aquatic habitat, advocating for water quality and quantity to sustain aquatic and recreational uses, and balancing the development of land and water uses for recreation with other public needs within the river corridor and watershed. The Plan identifies goals for river and watershed protection along with specific strategies to address them. The Implementation and Action Plan organizes the priority issues, actions, and strategies that allows for effective implementation over time. IRLAC advocates for implementation of the River Management Plan and supports integration of its goals and strategies by the corridor communities in their master plans, resource-based planning initiatives and land use decisions. The importance of the Isinglass River as a community resource is reflected in local planning and protection efforts of the communities along the River. The river is recognized extensively by the Town of Barrington and has been included in its Regional Environmental Planning Report and the town's Master Plan. The communities of Strafford and Rochester have also recognized the importance of the river as a community resource through the lease or purchase of riverfront lands that ensure public access and protect the undeveloped nature of riparian lands.